Nose Surgery, often called a Rhinoplasty , “nose reshaping” or even a “nose job”, is a surgery that improves the appearance and proportion of the nose enhancing overall facial harmony. Both the size and the shape of the nose can be altered by a nose surgery. Why do people choose rhinoplasty? Sometimes heredity, injury or even other surgeries can leave you with a nose that is not symmetrical or well proportioned in length or width to the rest of your facial features. In some cases, people may experience a breathing difficulty due to a fracture or natural deviation of the nasal septum. 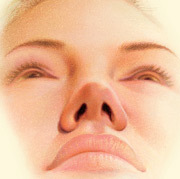 People may also have a nasal tip that is bulbous, drooping or upturned or nostrils that are large, wide or upturned. Others may experience humps or depressions in the bridge of the nose. These variations leave people feeling self-conscious about the appearance of their nose and can cause serious emotional distress. A nose reshaping surgery may involve incisions hidden inside the nose in a “closed rhinoplasty”, or an incision can be made across the columella, the narrow strip of tissue that separates the nostrils during an “open rhinoplasty”. Through these incisions, the soft tissues that cover the nose are gently raised, allowing access to reshape the cartilage and structures of the nose. Surgery of the nose can reduce or augment nasal structures with the use of cartilage grafted from other areas of your body such as the septum, the ear or from cartilage of the ribs. What can I expect from rhinoplasty? The end results of a rhinoplasty surgery are usually permanent, although some natural shifting of cartilage may occur over time as it does without rhinoplasty. Rhinoplasty can offer patients a more symmetrical and well-proportioned nose that is in harmony with the rest of the face and can improve self-image if done by a well trained plastic surgeon such as Dr. Armenta. How can I learn if rhinoplasty is right for me? If you’d like to make an appointment for a consultation to learn whether rhinoplasty is right for you, contact Dr. Art Armenta’s office. Dr. Art Armenta is a Diplomat and certified by the American Board of Plastic Surgery and is a member of the American Board of Plastic Surgery.